This guy is not the most spectacular card compared to some of the things we’ve seen in the last couple of blocks, but that’s okay – for one thing, he originally comes from an era where tribal lords were designed in a more uniform way and there was less expansive use of abilities. For another thing, he gives bonuses to two tribes known for things like swarming the table and being hard to kill; imagine what happens when they not only get a combat boost to go toe-to-toe with Soldiers and Goblins, but also take down Dragons and Angels with a single strike. Back in Alara, he gave Grixis’ unearth keyword a lot of extra punch, which has an eerie parallel in Amonkhet with the Scarab God and the Eternals. Death Baron was a $20 card before this reprint, which is impressive for a creature that sees no competitive play. Turns out that undeath is the best way to go for more casual decks. Part of what makes Death Baron legit is that it’s not just a Zombie tribal enabler; it also buffs Skeletons and gives everything that it buffs deathtouch. 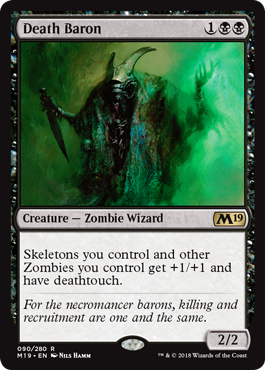 Coming off of Amonkhet‘s Zombie tribal theme, this gives Death Baron some friends to play with for the nonce, and it also gives it flexibility as to what decks it slots into. While it is but a fragile 2/2 with no protection, as long as you don’t drop Death Baron into an empty board, you should be fine.